The Bush administration is currently using the same propagandistic tactics to manufacture a crisis in Social Security as they used prior to the invasion of Iraq to portray an imminent crisis from weapons of mass destruction. There were no weapons of mass destruction and there is no crisis in the Social Security retirement program. 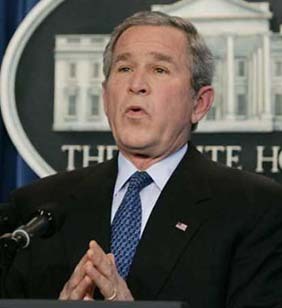 Not only is President Bush clearly demonstrating that the lesson he learned with the invasion of Iraq was that he could lie to the American public with impunity, but the major news media of America is once again proving that it will sit idly by and let the President say things that are plainly false without calling him on it. "In 1950, there were 16 workers to support every one beneficiary of Social Security. Today, there are only 3.3 workers supporting every Social Security beneficiary. By the time our youngest workers - those just entering the workforce today - turn 65, there will only be 2 workers supporting each beneficiary." The reality is that in 1950 the Social Security program was still in its early stages of implementation, when the majority of people who had paid into the system had not yet retired. In addition, changes were made to the program in the 1960s to expand coverage. By 1970 the system had matured to the point where it was operating at a level where it reflected the true number of retired vs. working people in the population and accounted for the new changes to the system. In 1970 the ratio of workers to Social Security recipients was 3.7 to 1. From 1975 through to today the ratio of workers to beneficiaries has been around 3.3 to 1. The system has been operating for the past 30 years with a ratio of around 3 workers to every beneficiary. "As a result of these demographic changes, the current system will not be able to afford to pay the benefits scheduled for our children and grandchildren without enormous payroll tax increases or huge benefit cuts. The Social Security payroll tax, which was once 2%, is now more than 12%. Economists calculate that under the current system, the payroll tax would have to rise to more than 18% if our children and grandchildren are to receive their scheduled benefits." The reason behind the possible need to increase the payroll taxes is not the changing demographics of the population, but rather it is the increase in income disparity. The fact is that the economy is continuing to grow, and as long as that happens then there isn't a demographics problem, however, the fruits of economic growth are going increasingly to the wealthy, as middle-class and poor workers face stagnant or declining wages while wages for executives and superstars climb beyond any rational measure of their contribution to society. Because of the fact that Social Security taxes are taken only from wages, and the tax is capped so that it only affects incomes below a certain level, it means that as income disparity increases a smaller and smaller portion of our national income is taxed by the Social Security system, putting a larger and larger burden on the middle-class and poor. In 1983 Social Security taxed 90% of American wage income. Today it only taxes 85% of American wage income, because now 15% of wage income is above the taxation limit. Over the past 25 years the productivity of our economy has increased substantially, which should increase the capacity of our economy to care for retired workers. The problem, however, is that virtually all of the productivity gains in our economy since the early 1980s have been realized by the top 1%, and thus do not contribute to our ability to sustain retirees through the Social Security program. Below is a graph demonstrating the portion of national wage income that is not taxed by Social Security. The portion in red is income that was not taxed by the retirement or disability portion of Social Security in 2000. "Most younger people in America don't think they'll see a dime"
"If you're 20 years old, in your mid-20s, and you're beginning to work, I want you to think about a Social Security system that will be flat bust, bankrupt, unless the United States Congress has got the willingness to act now"
This would in fact be impossible. As long as people work there will be money to pay Social Security benefits based on the way the system is set up right now. Social Security benefits are paid from money collected directly from taxation. The only way that all Social Security benefits would cease to be paid is if no one worked anymore, which would either be a result of massive technological advances that meant people no longer had to work, in which case Social Security wouldn't matter anyway, or the result of a total collapse of civilization, in which case no retirement scheme would be of value. In reality, there is a problem with the way that Social Security benefits are calculated. Right now, the scheduled benefits for retirees in 2050 are 40% higher in inflation adjusted terms than benefits today. When the statement is made that after the Social Security trust fund is depleted the system will only be able to pay out 70% of scheduled benefits, it means that the system would still be paying out higher real benefits than retirees get today! That is certainly not a crisis and not a condition of bankruptcy. "In the year 2018, for the first time ever, Social Security will pay out more in benefits than the government collects in payroll taxes"
This is a flat out lie. In 14 of the past 47 years of Social Security's operation, the program has paid out more than it collected in payroll taxes. In addition to that, even if it were true that it would be the first time, it still wouldn't matter. The trust fund has been intentionally built up over the past 15 or so years to prepare for the retirement of the so-called "baby boomers". Additionally, the trust fund is actually still projected to grow well past 2018 until some time around 2028. All that the 2018 date signifies is the moment at which some income from interest on the trust fund may begin being used to pay retirement benefits. There would be no point in putting any money into the trust fund at all unless we planned on taking it out at some point. The intention was never to continually put more and more money into the Social Security trust fund. It has always been intended that this money would be used to pay for the retirement benefits of the baby boomer generation. It is supposed to be used, yet President Bush presents the fact that this money will be used for its intended purpose as a sign of failure, when in fact it is not. The baby boomer generation will begin to retire around 2010 and some members of that generation will continue to inflate the numbers of retirees for another 30 to 40 years. This means that the baby boomer generation is going to be a major budgeting factor for Social Security to address between the years of around 2010 and 2050. This is exactly the period of time that the Social Security trust fund is projected to last without any changes made to the system whatsoever. The latest projection by the Congressional Budget Office is that the Social Security retirement trust fund will have a positive balance through 2052. In theory, there is little need for a Social Security trust fund at all. Normally the trust fund should be small, with only enough funds in it to cover yearly fluctuations in benefit payments. The only reason that there is a need to build up the trust fund to the large degree that we have for the past 15 years is to accommodate the baby boomer generation, which the system is currently on track to do. The above graph is based on reports from the Social Security Trustees, not the CBO report. As was mentioned earlier, even if the trust fund is completely depleted, the system will still be able to pay out higher benefits to each individual than it pays out today. Does Social Security Face a Crisis in 2018?